Guy de Maupassant was another writer I encountered for the first time last December (with Femme Fatale). A master of the short story, Maupassant is often unregarded as a novelist, and Alien Hearts, his final novel, is perhaps the least appreciated of all, having waited a long time for this modern translation by Richard Howard. In summary it is a rather stark love story, though it does, of course, contain many of the psychological insights which characterise his stories. It takes place among the upper classes, detailing the relationship between Andre Mariolle, a wealthy bachelor of no fixed vocation, and Madame de Burne, a young widow. A love triangle of sorts, it could be argued that the third angle is love itself as both characters seem as interested in their relationship with love as with each other. De Maupassant cleverly ensures our sympathies remain balanced: Madame du Burne’s initial honesty grants her some leeway with the reader, as does the sincerity of Mariolle’s love. The more she gives him, however, the less satisfied he becomes, and, as will later be demonstrated, trying to match the love of another is not as straight-forward as he believes. 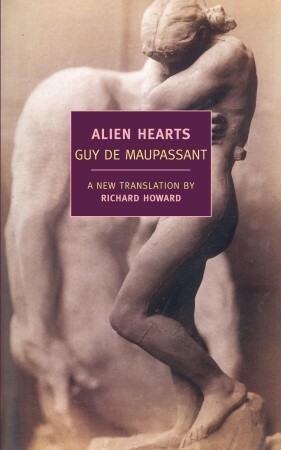 De Maupassant also avoids rushing headlong towards a tragic conclusion, leaving us with something far more nuanced and ambiguous, for, while the plot of Alien Hearts may seem a little dated, the emotions it exposes pulse as fiercely in our veins today. You are currently browsing the archives for the Guy de Maupassant category.